Introduction – What is the color of home? 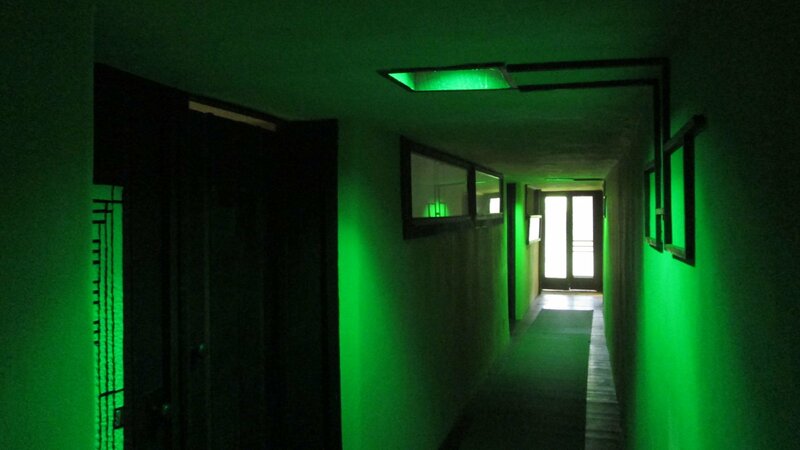 began with a series of simple light interventions in the dormitory hallways of the Taliesin Hillside Studio building. A spectrum of colors, including red, orange, green and blue, were introduced into the space over the course of 12 days. These initial interventions, installed during periods of low activity, were intended to call attention to how color might inform our emotional or psychological response to a space. Look – How have the colored lights made you feel? How do the current colors make you feel? How do the current colors compare to the previous colors? What is the color of home? Discussion – For Hillside Studio residents, discuss with your door neighbor the questions above and come to a consensus on a color you would like to call home. For residents living elsewhere in Taliesin who would like to participate, first identify a lightbulb you would like to activate. Second, talk with the appropriate staff member to get permission to change the buib. Finally discuss with any other residences the change might effect and come to a consensus on a color you would like to call home. Choose – Choose between red, orange, green, blue or back to white. Once you have come to a consensus, stop by my desk and let me know your choice and we will start swapping colors on Monday July 21st starting with the Hillside dorms. For those in other parts of the Taliesin, I can either come install the bulb for you or simply give you the bulb to swap out yourself. I will do my best to accommodate all requests.